I had a decent rest last night so I’m much better but feeling extremely tired. J’s friends came round for a playdate so I fortified myself with mini-apple crumble tarts for breakfast and just carried on. The kids are playing “Ravensburger Labyrinth“ (I talked about this in a previous post) and another game called Marrakech . Well now, we had some friends round in the morning to join us in our Advent activities – and they brought a delicious homemade gift! 10/10 would playdate again. The kids really liked the origami angel that I folded yesterday, so we tried our hand at folding paper ‘Mary’ dolls together. We followed these instructions from Soulful Mamahood. I was surprised that the kids could actually do it with some guidance, although they had to be constantly reminded to be slow and precise with each fold! Origami is a real exercise in patience. People who roleplay tend to be a shy bunch, so they’re not always super-easy to find. I met most of my best friends at roleplaying conventions. They’re a great and (usually) safe place to meet up with other people who are interested in the same things that I am. Since I’ve only recently moved into the Newcastle area, I wanted to get in with other gamers in Newcastle and hoped that I could attend a convention or similar gathering to meet some. Thankfully, I didn’t have to wait long as roleplayers in Newcastle had been clamouring for a roleplaying convention of their own. NewCon, the Newcastle Roleplaying Convention, just started this year and the Boobook and I had a wonderful time attending. For those of you who haven’t heard about roleplaying, it is, in its most basic form, a shared storytelling experience. People pretend to be various characters within the story and go on imagined adventures together. There are many different types of rules and story settings for this sort of game, though the most famous of these would be Wizards of the Coast’s ever-popular Dungeons and Dragons fantasy setting. The convention was held at the local leagues club and entry fees weren’t very steep – just a gold coin donation to your choice of charity (Beyond Blue or White Ribbon) and away you go! While I was at the convention, I ran two games of Engine Heart, a free setting about robots. In it, my 5 players took on the bodies of 5 little household robots, as they worked together to escape the house that they were trapped in. We had a lot of laughs and it was interesting to see how different people came up with different solutions to the robots’ main problem of figuring out how to turn a doorknob when none of them had hands. I played a few games too – Droo and I had a go at trying out Fiasco, a crime caper simulation game that randomises characters and settings for truly unexpected plot twists ala Lock, Stock and Two Smoking Barrels or Burn After Reading. We couldn’t stop laughing throughout the game as our crime trio made one blunder after another as their attempt to kidnap a Russian mobster resulted in one of them being tied to a giant teddy bear and paraded around the streets of London atop a Mini Cooper. We also tried some new board games courtesy of Serial Games. We played several rounds of a competitive board game called Tsuro: The Game of the Path, which proved to be quite entertaining. The Boobook intends to purchase said game sometime in the future so that we can play it with friends. The object is to stay on the board and not collide with anyone else. This is much easier said than done. Plus, I got to meet up with a group of Vikings (more on that next week) and even signed up for the local chapter of the International Game Developers Association! All in all, I had a wonderful time at NewCon 2016. I’m glad that most of the proceeds of the convention went to charity. They even had a charity auction of various games. Thanks to Good Games for running a great convention! We’ll definitely be back next year! I love wooden building blocks so much that I’ve amassed a rather sizeable collection. I just love the tactile feel of the wood beneath my fingers and the scope for creativity that building blocks have (and the fact that I can build and disassemble structures without pain). However, J and Little E have moved on from wooden building blocks to Legos quite a long time ago, as the sort of creations that they could make with building blocks were limited by the fact that their creations kept breaking apart or toppling over. The blocks have been in storage for quite a while now, waiting for Thumper to get old enough to play with them. 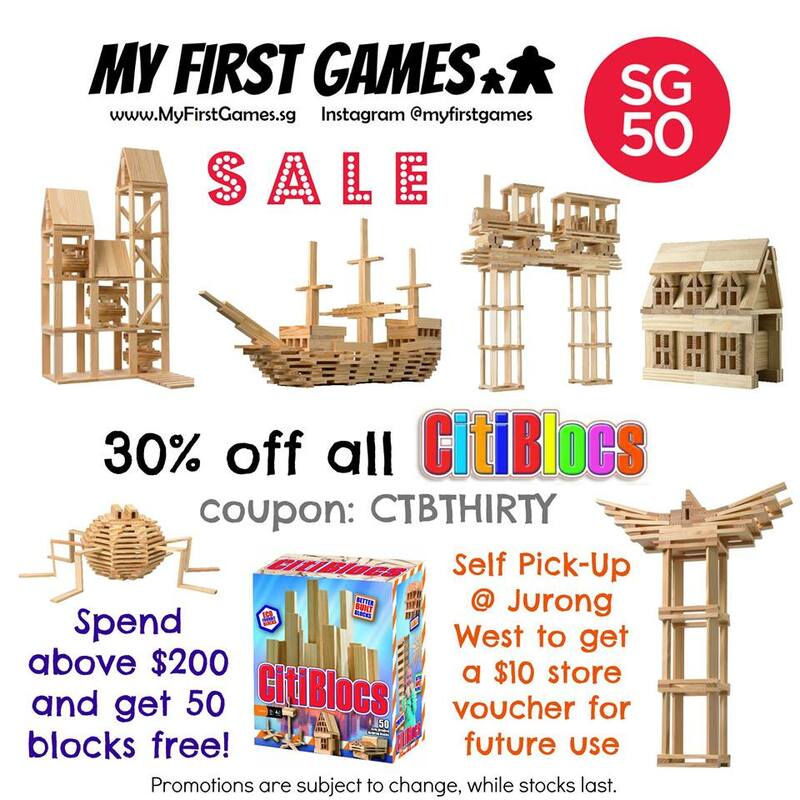 When my friend, Pamela (from Tan Family Chronicles) asked if I would be interested in checking out the Citiblocs range from the My First Games webstore, I was not sure if my kids would even play with them, and I told her so. “No. My blocks can’t build any structures remotely NEAR that scale. I mean, that is…that is just…the level of precision…the structural stability…so architectural…”, I blustered finally, struggled to find the words to describe what I had seen. Pamela nodded and patted me on the shoulder. Anyhow, I was completely sold on Citiblocs. I knew that if I showed J and Little E what they could build with these blocks, they would LOVE it. The Citiblocs are made from Radiata pine wood from a sustainable source in New Zealand and are certified safe and non-toxic. They are sold in different colour combinations – Natural (original pine with no wood stain), Cool (red and yellow tones), Hot (blue and green tones) and Camo (green and brown tones). Pamela was kind enough to give me one box of each colour combination to try out. Each block is exactly the same size, shape and weight, and the surfaces of the blocks are straight and flat, whilst being textured just enough to increase the friction between the blocks (but not so much that it creates splinters). This precise cut and uniformity of the blocks is what makes them so special After playing with them with my kids, I understand why these blocks have won so many toy industry awards! The Barn Owl, who was recovering on the couch after working through the night, lazily started building a spiral staircase. J started on his own Tower of Babel, with the tower stretching far beyond what we would expect from any of our other building blocks, and Little E even discovered how to make a simple cantilever design. There was a little booklet inside the boxes filled with pictures and ideas for some basic designs and some more complicated ones – no stepwise instructions needed. Impressive, right? 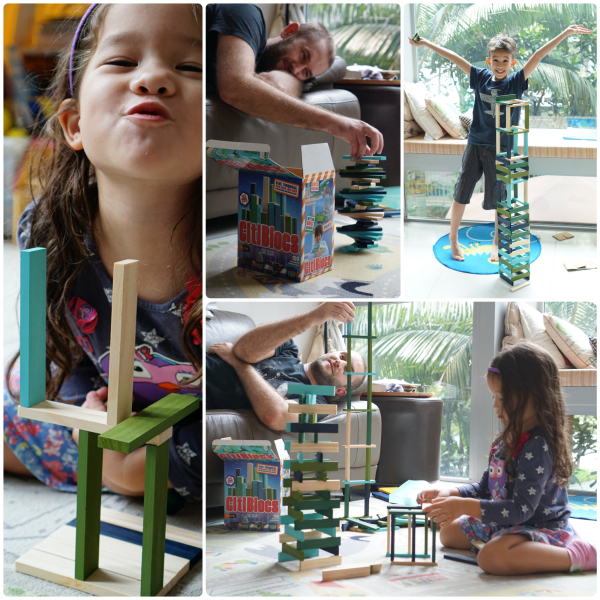 These blocks are really much more fun than my other building blocks and they do encourage kids to be more creative, whilst instilling in them a rudimentary understanding of physics. The more precisely the blocks are placed, the more complex structures can be built – what a way to train fine motor skills! Additionally, since there are no snaps or screws involved, large creations are easily dismantled and put away at the end of the day (as you can tell from our Guide to Citiblocs video below). And the best part of all this is that they keep my kids quietly occupied for hours. Which is the main point. I was so excited about these blocks, I decided to buy some more block sets as gifts for my nephews and nieces, as well as a set of CitiBlocs Little Builder Rattle Blocs (for when Thumper is old enough) which won the Oppenheim Platinum Award…after all, Christmas is just round the corner, and My First Games is holding a special Citiblocs promotion! Just enter the coupon code: CTBTHIRTY at checkout to enjoy 30% off the entire CitiBlocs range at My First Games! (And you get an extra 50 blocks if you spend about $200!) What a bargain! 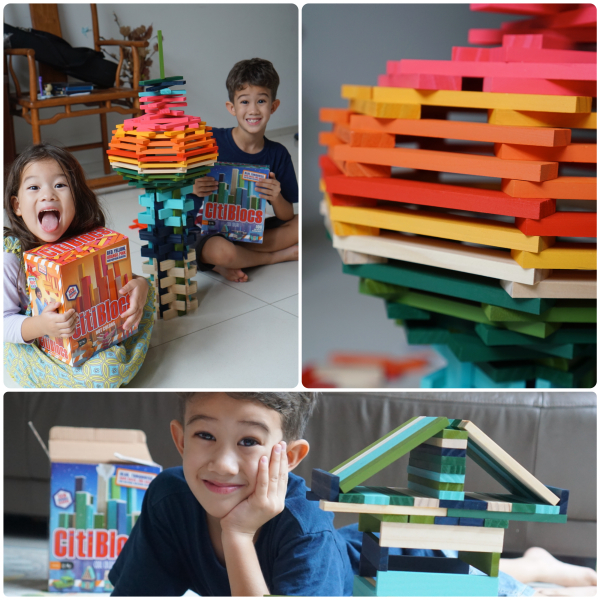 I am seriously considering getting more Citiblocs to add to our collection so as to challenge J and Little E to build even more complicated structures!